Apparently elsewhere people will pay forty bucks for a pickling class while I’ve been just giving this stuff away. I am pretty sure this kind of thinking led to the birth of the prostitution, but unlike these enterprising women (and men) I keep doing it for free for the love of the craft. And what’s not to love: pickling transforms ordinary fruits and vegetables that will probably rot in the dark corner of your refrigerator into a delicious food that goes well with everything (especially with hard liquor), keeps well and pretty effortless to make. If you ever tried revolting, cloyingly sweet, mouth-puckering watermelon pickles you might have seen in the grocery store, you are probably not in a hurry to repeat this horrifying experience, which, if your Mom was right, would have left a permanent grimace of disgust on your face. 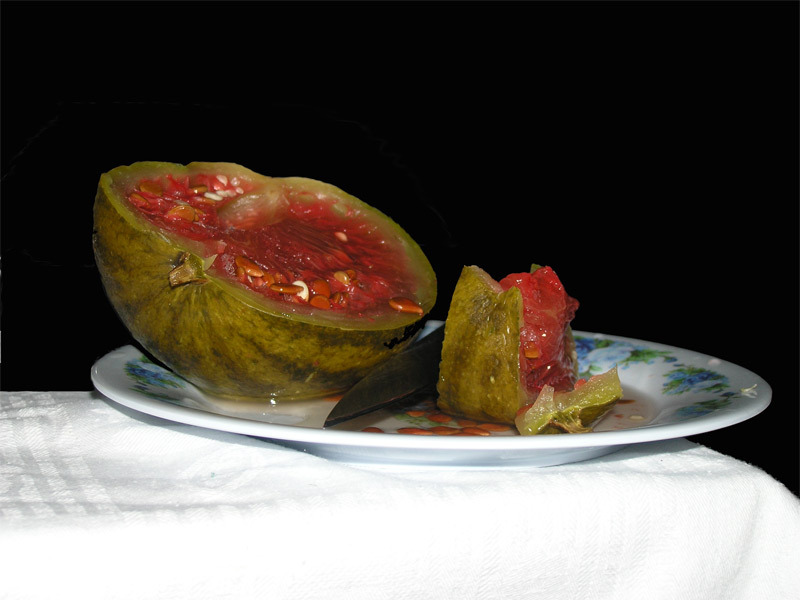 On the other hand, Russian pickled watermelons are a delicious refreshing treat. Originally watermelons were pickled whole in wooden barrels, but I suggest you start slow before digging up a root cellar in your backyard, buying 100-gallon barrels and stocking up on watermelons. How many times have you purchased a watermelon that was not so great – pale and not very sweet? You are too tight to throw it away, so you do the next best thing – make your kids eat it, or invite omnivorous guests. Pickling will greatly improve your reputation of an evil parent or a stingy host. For this recipe you will need a jar, a watermelon (thinner rind preferred but not required), water and salt. By the way, don’t you hate when you buy a seedless watermelon and it’s full of seeds? I guess we differ on our definition of the word “occasional”. Slice the watermelon in chunks sized to fit in your jar; actually any container will do, pickled watermelon loves creativity. Place in the jar. …and pour in the jar until the watermelon pieces are covered. If necessary, make more solution keeping the proportion of salt to water. If you don’t have kosher salt, any salt would work, but iodized salt may affect the color of the end product. Cover loosely and leave on the counter for 2-4 days; things will start happening, maybe some bubbles, or even a white-looking film will appear on top of the brine. Don’t worry, as they say in the health-food stores: “It’s all natural”; just skim it off the top. After a few days place in the fridge. Next time you have guests, you don’t have to feed them an unripened watermelon, instead offer them a slice of pickled watermelon with their meal. They will beg to come back again. Just to think that I just gave this away for free, next time I will ask for a dinner and a movie first.